NoMad Dreams is a wonderfully diverse Boston-based band whose members (from five countries and four continents originally!) bring to the fold influences from all over the world. From the start, they drew their inspiration far and wide--from Russian lullabies, to Brazilian bossa nova, to American jazz standards and African rhythms. While their stylistic palette blends world music, jazz, and pop elements, the band's founders--vocalist Vlada Brofman and pianist Georges Nile--were initially drawn together by their passion and enthusiasm for French chanson, which they explore more fully in this new breathtaking program. 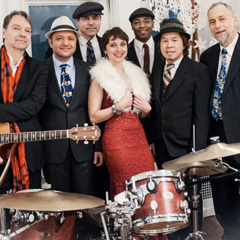 Eventually joined by Wing La (drums), Tom Curatolo (bass), Chris Brenne (guitar), and occasionally featuring magnificent Dave Birkin on saxe and flute, for over five years, NoMad Dreams have performed at New York and Boston's jazz venues and festivals (most notably, Best of France (2015) Festival at Times Square). NMD's self-titled debut album appeared in 2015; produced by Sean McLaughlin (Producer of the Year (2013), New England Music Awards) and Benny Grotto, their original songs deliver "mellow, good-hearted music, with a funky folk feel and a world music instrumental breadth" (Zachary Bos, Wonder Reflex Blog). "Simply delightful" and "fun from start to finish" (Shauna Erlbaum, thenoise-boston.com), the album rose to #20 on CMJ jazz charts. This year, NoMad Dreams return to their foundations, digging deeply into the romantic world of French chanson. Their special Valentine week concert brings to you a century of chanson's most spectacular performers and songs: from the classics of Charles Trenet and Lucienne Boyer, to the brightest stars, including Edith Piaf, Charles Aznavour, Jacques Brel, Serge Gainsbourg, and Henri Salvador, as well as the genre's younger generation (Zaz, Coralie Clément, etc.). Vlada Brofman, the band's versatile vocalist, with her "voice of verve and sass" (Shauna Erlbaum, thenoise-boston.com), fully projects the genre's hallmark qualities--its gripping drama, an utmost attention to delivery of lyrics, and a magnetic charisma on stage. Each song comes alive with a new persona, giving the listener "a sensation of being at a feast, or witnessing a minor wonder, of which you should remember every second" (Aleksey Kartashov). Blogger Victoria Kichuk expressed what many listeners have admired after NMD's live performances: Georges Nile's sensitive and sensuous arrangements and "delicate piano work set the listener adrift to foreign lands," so the audience can easily imagine themselves "in breezy cafés and moonlit plazas filled with painters and artists living off their passions."